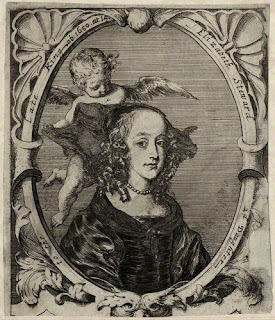 The daughter of the ill-fated Charles I, king of England, and his queen, Henrietta Maria, Elizabeth Stuart didn't have much of a life. It might all have turned out quite differently for her--in 1636, while the Stuart princess was still an infant, her grandmother, the French regent Marie de' Medici was interested in arranging a match between the baby and William, the prince of Orange (the future William II of Orange). Although King Charles was not impressed with the prospects of such an alliance and rejected it for Elizabeth, he later accepted it for his eldest, Mary Henrietta, in 1641, after other marriage negotiations fell through and his economic situation grew dire. After the outbreak of the English Civil Wars in 1642, Elizabeth Stuart and her younger brother, Henry, duke of Gloucester, were taken into the "care" of Parliament, placed into the hands of a series of "guardians" assigned to the task. In 1643, she was moved to Chelsea, where she was tutored by a woman we have met before, the scholar Bathsua Makin; with Makin, the princess studied classical and modern languages and mathematics. In 1644, when Elizabeth was nine years old, Makin wrote about the princess's accomplishments, and although it is not absolutely clear, she may have remained as the girl's tutor until Elizabeth's death. Meanwhile, in 1647, Elizabeth and her brother were allowed to spend two days with their father, who had been captured and was being held by parliamentary forces. They had more occasion for visits when the king was moved to Hampton Court palace, but after his escape, there would be no more time spent with him. In 1648, parliament acted to reduce Elizabeth's household, a decision she protested in a letter: "My Lords," she wrote, "I account myself very miserable that I must have my servants taken from me and strangers put to me. You promised me that you would have a care for me; and I hope you will show it in preventing so great a grief as this would be to me. I pray my lords consider of it, and give me cause to thank you, and to rest. Your loving friend, Elizabeth." The princess was moved to St. James's, where she was held in close captivity. After her father's trial and condemnation, she again wrote parliament, asking for permission to join her sister on the continent, in the Netherlands. Denied even that, the thirteen-year-old Elizabeth and her younger brother, were allowed to visit their father before his execution. 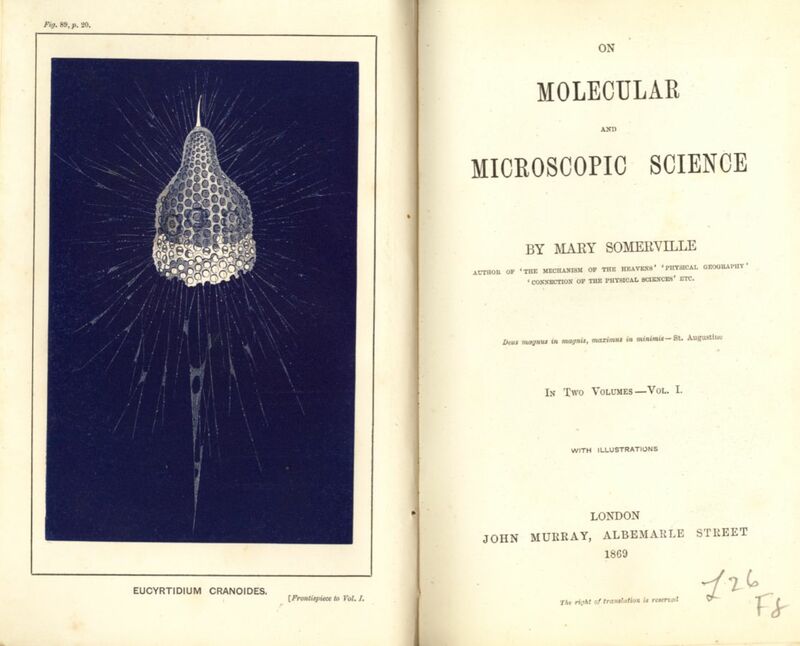 He bid us tell my mother that his thoughts had never strayed from her, and that his love would be the same to the last. Withal, he commanded me and my brother to be obedient to her; and bid me send his blessing to the rest of my brothers and sisters, with communications to all his friends. Then, taking my brother Gloucester on his knee, he said, "Sweetheart, now they will cut off thy father's head." And Gloucester looking very intently upon him, he said again, "Heed, my child, what I say: they will cut off my head and perhaps make thee a king. But mark what I say. Thou must not be a king as long as thy brothers Charles and James do live; for they will cut off your brothers' heads when they can catch them, and cut off thy head too at the last, and therefore I charge you, do not be made a king by them." At which my brother sighed deeply, and made answer: "I will be torn in pieces first!" And these words, coming so unexpectedly from so young a child, rejoiced my father exceedingly. And his majesty spoke to him of the welfare of his soul, and to keep his religion, commanding him to fear God, and He would provide for him. Further, he commanded us all to forgive those people, but never to trust them; for they had been most false to him and those that gave them power, and he feared also to their own souls. And he desired me not to grieve for him, for he should die a martyr, and that he doubted not the Lord would settle his throne upon his son, and that we all should be happier than we could have expected to have been if he had lived; with many other things which at present I cannot remember. The two children were regarded as even more of a burden after their father's execution--parliament refused the repeated offer of sanctuary in the Netherlands, and a succession of men appointed to act as their guardians rejected the duties the job entailed. 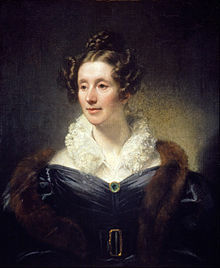 Elizabeth found some respite under the care of Robert Sidney and his wife Dorothy Percy, who extended kindness to the girl. But even this didn't last--in 1650, when her elder brother, who would one day become Charles II, entered Scotland, the frightened English parliamentarians moved Elizabeth to the Isle of Wight, despite her pleas of ill health. She developed pneumonia and died on 8 September 1650, shortly after the move to Wight. She was fourteen years old. When she was eleven years old, am ambassador from France had called her a "budding young beauty" who had "grace, dignity, intelligence and sensibility." But when her remains were examined in the nineteenth-century, it could be seen that she had suffered from rickets, resulting in shoulder and back deformities that would have made it difficult for her to walk--the result, surely, of the deprivations she suffered. 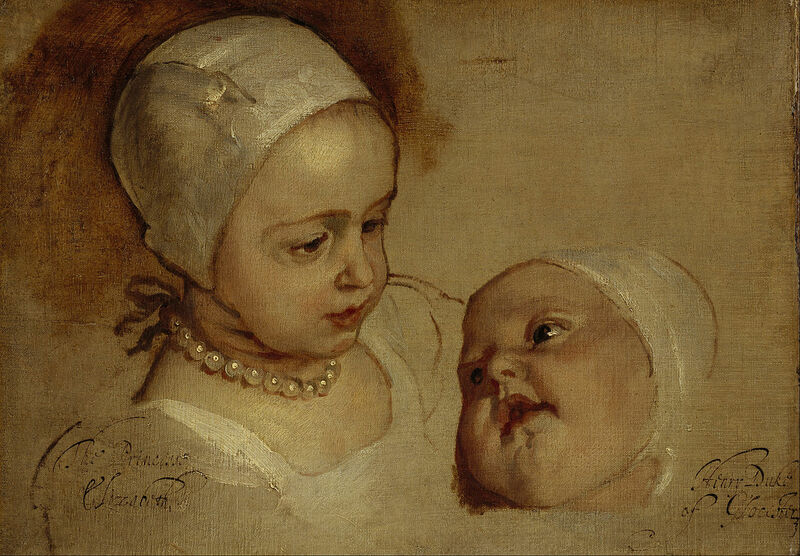 You may be interested in this BBC History Extra podcast, in which historian Linda Porter discusses the unhappy fate of Charles I's "left behind" children--click here. For a post on Elizabeth Stuart's sister, Mary Henrietta, click here. 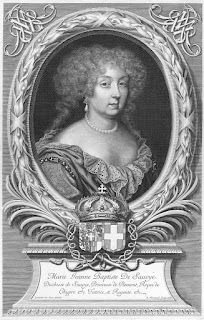 Marie-Christine of Bourbon, known more simply as Christine of France, was the daughter of Henry IV of France and his second queen, the much-maligned Marie de' Medici. 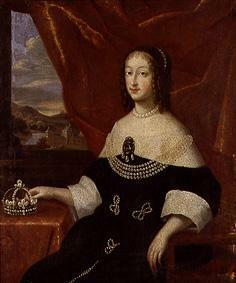 She was born on 10 February 1606, the third of their six children. Christine's elder sister, Elisabeth, and her younger, Henrietta Maria, both became queens--Elisabeth became the queen of Spain, Henrietta Maria, the queen of England. Elisabeth would give birth to eleven children, only two of whom lived past childhood, however; she was regent of Spain for her husband, Philip IV, but she died young, only forty-one years old. While Marie-Christine did not become a queen, she married Louis Amadeus, the duke of Savoy, in 1619. Although she brought as much culture and splendor to the court of Savoy as she could--and although she maintained a close and intimate correspondence with her younger sister, the queen of England--the ambitious Marie-Christine encouraged her husband to claim the title of king of Cyprus and Jerusalem even after he succeeded as duke of Savoy in 1630. After her husband's death in 1637, Christine claimed the title of regent of Savoy. Her eldest son died the next year, but Christine retained her role, acting from 1638 as regent for her second son, Charles Emmanuel (b. 1634). Although she resisted French influence, her husband's younger brothers, not content with their positions after Louis Amadeus's death, began a civil war with Spanish support. Anyway, Christine had successfully settled matters and retained her position as regent of Savoy until 1648, when her son, at age ten, achieved his majority. Although her formal role ended, she continued to govern for him. His delayed marriage--he didn't marry until 1663--is frequently interpreted as a sign of his mother's desire to hold onto power. When he did marry, in April of 1663, Charles Emmanuel married his first cousin, Françoise Madeleine d'Orléans, the daughter of his mother's younger brother, a young woman reportedly chosen because of her docility. Marie-Christine of Bourbon, regent of Savoy, enjoyed an exuberant personal life--she took lovers and enjoyed life's luxuries and pleasures as well as wielding political power. 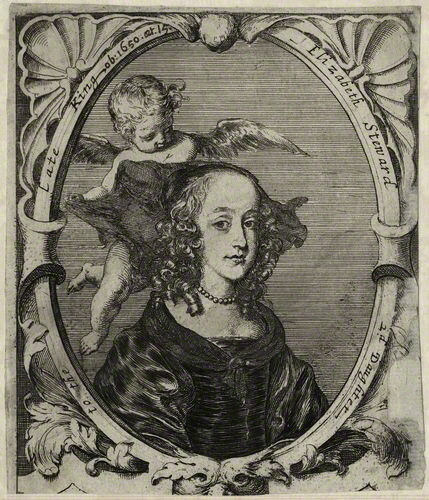 Christine died on 27 December, just months after her son's marriage. She was fifty-seven years old. The best account of Christine of Savoy is in Robert Oresko's "Maria Giovanna Battista of Savoy-Nemours (1644-1724): Daughter, Consort, and Regent of Savoy," in Clarissa Campbell Orr's Queenship in Europe, 1660-1815: The Role of the Consort. By the way, the subject of Oresko's essay, Marie Jeanne Baptiste, had been proposed as a bride for Charles Emmanuel in 1659, and after being "inspected" by her potential husband and his mother, she was rejected by Marie-Christine, perhaps because she did not seem so very malleable. Charles Emmanuel, however, wanted her as his wife, and after the death of his first wife, Françoise Madeleine, just a month after the death of his mother, Charles Emmanuel married Marie Jeanne, now known as Maria Giovanna. After his death in 1675, Maria Giovanna became regent of Savoy. Update: To respond to the question posed below, in the comments, about the changing of Marie Jeanne Baptiste's name to Maria Giovanna--royal and noble women's names were frequently changed to reflect the language of the country of their marriage. In perhaps the most well known example, Catalina de Aragón became Catherine of Aragon when she arrived in England. 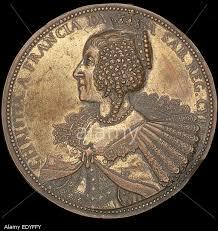 Thus Marie Jeanne Baptiste's name was Italianised when she married into the House of Savoy. (Also, I originally wrote "Jeanne" as "Jean," and it's been corrected here. "Artemisia Gentileschi and Her Time"
Driving home late this afternoon after a long lunch with my best friend, Tom, I heard a story on All Things Considered by my favorite NPR reporter (Sylvia Poggioli) about my favorite artist, Artemisia Gentileschi. 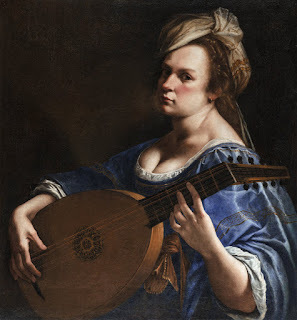 I've posted about Artemisia Gentileschi and her work before (click here), recounting my experience of wandering around the Uffizi, turning a corner, and suddenly coming face to face with one of her paintings (as opposed to a color plate in an art book) for the first time. Years later, a trip back to Italy became, for me and my enthusiastic son, something of an Artemisia pilgrimage (or, more accurately, obsessive stalking), as I tracked down as many of her works as I could in the time I was traveling. So I was particularly excited to hear Poggioli's report announcing the opening of an exhibition of Artemisia Gentileschi's work in Rome. How wonderful that such a gathering of her work is now on display in one place. And, hey, it isn't even some dutiful recognition of her life--she was born in 1593 and died in 1653, so it isn't a four-hundredth anniversary of her birth or death or anything . . . It's almost like she's an artist worth celebrating because of the power of her painting! It's still not, strictly speaking, a solo show--a third of the 95 or so works on display are Artemisia's (the rest by contemporary artists she knew and younger painters on whom her work had an influence). 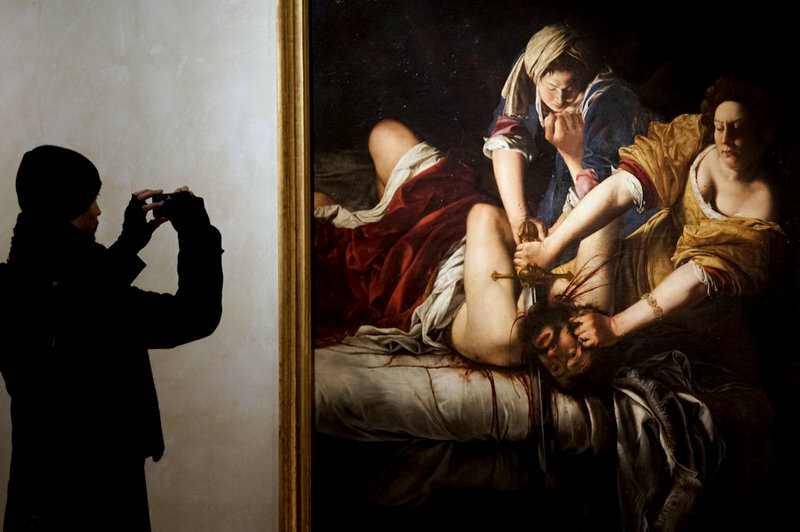 In 2002, a father-daughter exhibition, "Orazio and Artemisia Gentileschi," was hosted in Rome and in the U.S., at the Getty Museum (Los Angeles) and the Metropolitan Museum of Art. A painting by Artemisia was sold at Sotheby's two years ago for more than $1 million. I know, I know . . . I'm never satisfied . . . There are lots of pieces in the Italian press on the exhibit if you can manage in Italian. There is also a great piece by Lucy Gordon in La voce di New York (it's in English; click here). I should also add that Gentileschi's Susannah and the Elders is included in the UK's National Gallery "Beyond Caravaggio" (12 October 2017 to 15 January 2017. 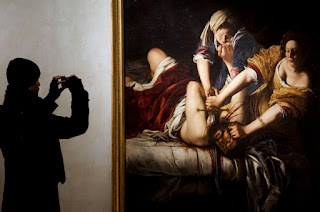 You may be interested in Jonathan Jones's comments on Gentileschi, "More Savage than Caravaggio: The Woman Who Took Revenge in Oil" (The Guardian)--to access the piece, click here.